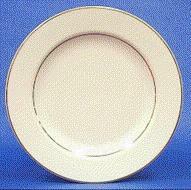 THIS IS THE OLD STYLE CHINA. THE "H" STANDS FOR HOMER!!! DON'T MIX THIS WITH THE REGULAR GOLD BAND CHINA!!!!! * Please call us for any questions on our gold band ivory h 7.5 inch salad plate in Tyler, serving Longview, Palestine, Athens, White Oak, Shreveport LA in East Texas and Western Louisiana.